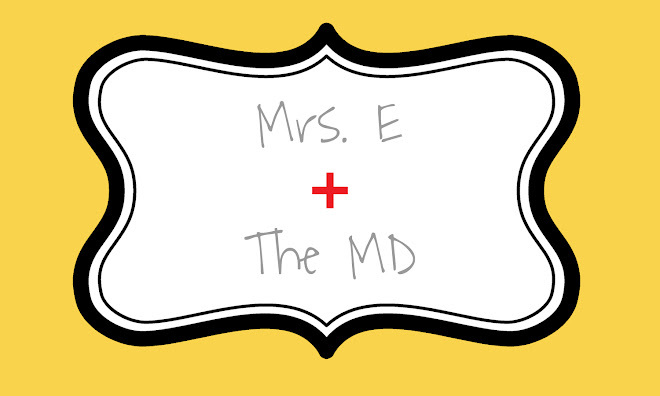 Mrs. E and the MD: Due. Last year, this date was Noelle's due date! Now, we all know she came a little early on the 11th, but March 23rd was the day we counted down to and prayed for and anticipated for 9 long months! In honor of this special day, I wanted to take a second to write down some of the things I have learned about growing and raising a baby. 1) Don't buy or wear maternity clothes too soon. You might think you are "huge" at 12 weeks and that you need the elastic pants, but you don't. In fact, you will feel really silly thinking you are "huge" when you look at yourself at 38, 39, or 40 weeks. This would be the definition of huge. Until then, enjoy your little waistline as long as possible. The bump will come. 2) Buy or rent a fetal doppler. It is amazing for your peace of mind. 3) Unless you are like those women on the crazy TV shows, your baby will most likely not arrive in 20 minutes. If you go in to be induced at 7 a.m., don't expect a baby by noon. If you get a baby by noon, that is a bonus. 4) It will take a good 2 or 3 months for that dark line going down your belly to fade. 5) It is totally normal to cry A LOT in the weeks following the delivery. I did, and I totally thought I was heading toward the whole postpartum depression thing, but after about a month (which is the normal time frame), it all went away. If the "blues" don't go away after a month, talk to your doctor. 6) It will take the entire first year of your child's life for your body to return back to "normal" and for you to feel "normal." Unless you live in Hollywood. In that case, you will return to "normal" 3 days after the baby is born. 7) As for getting your baby to go to sleep, I wouldn't try to put the baby on a schedule in the first 6 or 8 weeks. Hold the baby and do whatever the baby needs to go to sleep. However, after that, start paying attention to the signals that your baby is tired. Noelle rubs her eyes, and we know it is time. It doesn't matter if it is an hour earlier than normal, she is going to bed when she rubs her eyes. We also put her down awake more often than not. She has learned to fall asleep on her own without us rocking her or holding her. 8) Do not fall into the trap that if your baby is up later, he or she will sleep in longer. No. No. Nope! The opposite will be true! The baby will not sleep deeply and wake up earlier...so now you have just been up later and will wake up earlier! Not good! 9) Even though you will, do not try to compare your child with other children his or her age. Do not get jealous when another child crawls before yours. Unless your doctor is worried, don't give a second thought if your child isn't matching up to the milestones in those little weekly emails you get from Baby Center or Pampers. 10) Above all else, use common sense. 'Nuff said.